Blind swimmer Tharon Drake, right, seeks the hand of fellow swimmer Lt. Bradley Snyder to congratulate him on winning the 400-meter freestyle event in record time on Thursday at the 2012 U.S. Paralympics Swimming Trials in Bismarck, N.D. Snyder earned a spot on Team USA's swim team for the Paralympics later this summer in London. London is calling for Lt. Brad Snyder. 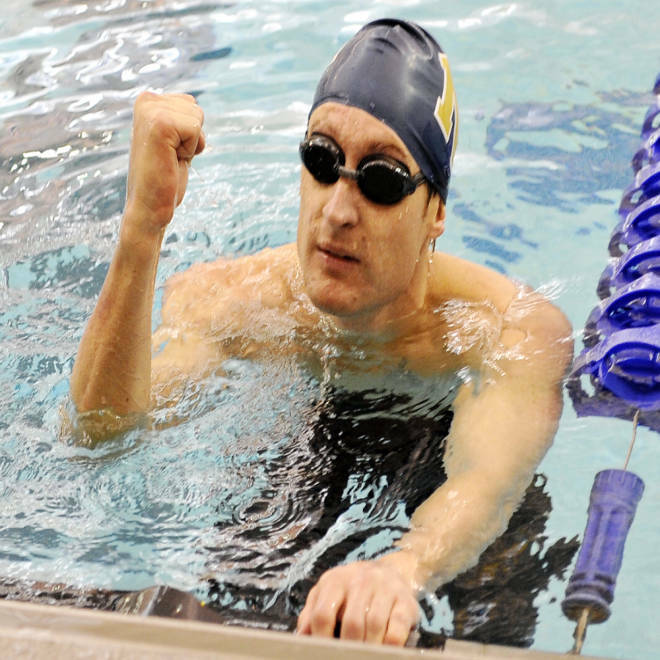 The former Navy bomb defuser, who last September lost both eyes in an Afghan explosion, formally gained a roster spot Sunday on the U.S. Paralympic team bound for England, after swimming what he agreed was the race of his life. “I’m super excited,” said Snyder, 28. “Normally, I’m a little too prideful to admit I am nervous before a race. But I was a little nervous. There was a pretty sizable uncertainly” that he would swim well enough to qualify. To earn a ticket to London later this summer, Snyder needed to swim at least 41 seconds faster than his previous best in his top event, the 400-meter freestyle. In competitive swimming, where outcomes usually are measured in tenths of seconds, 41 seconds is an eternity. But Snyder didn’t simply meet his goal. He demolished it, going 54 seconds faster than he ever had since losing his sight. Snyder clocked a 4:35.62 – now the current, world-best time at that distance for fully blind swimmers. Need more context? That time was just 1.5 seconds behind the mark he posted at that distance while swimming for the Naval Academy seven years ago, when he could see the lane lines, the competition and, most importantly, the wall. Editor's note: This is the third installment that chronicles Lt. Brad Snyder's efforts to earn a spot on Team USA's roster for the 2012 London Paralympics. Read the first story here and read the second story here. Still, he had to wait until Sunday morning when the U.S. Paralympic swimming coaches announced the 14 names on the American men’s roster. To hear the news, hundreds of athletes, family members and coaches packed an academic hall at Bismarck State College, host of the meet. Dozens more people couldn’t be seated and waited for news while standing in a nearby hallway. Eleven names already had been read before Snyder finally heard his. He stood, felt a massive wave of emotion rising in his throat and then walked, led via one arm by his brother, Mitchell, toward most of the rest of the men’s team already gathered at the front of the room. At the swimming trials, Mitchell served as his brother’s “tapper” – a person assigned to touch a blind swimmer on the head or shoulder with a walking cane to warn him or her that the wall is near and that a flip turn or a finishing kick is needed. No other communication is allowed between the tapper and a swimmer. Snyder joins a rising corps of wounded U.S. servicemen and servicewomen who will again battle for their nation overseas – this time as Paralympians vying for gold medals in track, cycling, archery, wheelchair tennis and an array of other sports. More than 30 active-duty and retired soldiers and sailors are expected to make the 2012 American Paralymic team – double the number that competed for Team USA at the Beijing Paralympic Games four years ago. “You can look at it and say, unfortunately, we’re having a lot of guys hurt. But at the same time we’re having a lot of guys hurt who are finding relevancy in going out there and succeeding post-injury,” Brad Snyder said. “We’re finding a way to get past, finding a way to strive for success just the way we were in the military. This week, Snyder will return to his intern job at a Baltimore software company. And he will continue training at a Baltimore aquatic center with his coach, Brian Loeffler, in preparation for the London Games. At the 2012 Paralympics, he also will be considered a front runner for a gold medal in the 100-meter freestyle. At the Bismarck trials, Snyder swam that event in 57.75 seconds – now the current, world-best time for blind athletes. But he’ll never forget, he said, his very first race in Bismarck – the chase that offered Snyder his first solid proof that he could, once again, be the best in the world at something. With an entry time of 5:29, Snyder wasn’t fully sure he could finish close to the 4:43 mark held by Spaniard Enhamed Enhamed – formerly the holder of the record in the 400-meter freestyle. Among blind swimmers, Enhamed has been a giant for years, collecting four gold medals at the Beijing Paralympics. Last Thursday morning, amid the preliminary heat for that same event, Mitchell Snyder glanced at the pool clock several times from his tapper position as his brother churned his arms and kicked his feet. Knowing he had a world-best time already tucked away in the prelim, Snyder said he was able to relax and swim the event’s final race that night much more freely. But again, after he touched the wall at the finish, he didn’t know how he had fared.